If this is your first foray into full-frame photography, you’ll notice an immediate difference compared to standard DSLR cameras with smaller sensors. Full-frame gives you a wider 84° angle of view, compared to a 62° diagonal angle of view from most standard sensor cameras with a 35mm lens. You’ll also immediately notice the improved optical quality. Combined with the incredibly high ISO sensitivity for low-light photography, the 6D Mark II is one of the most versatile DSLRs available. With so much tech packed into a single body, you don’t need to carry excess equipment around. So you can focus your buying power on the choice of Canon lenses to fit, including the Canon EF 70-300mm f4.5-5.6 DO IS USM, a great zoom lens and the first in the world to feature a DO element, or the Canon EF 100mm F2.8 Macro USM Lens, a quality, all-purpose macro. 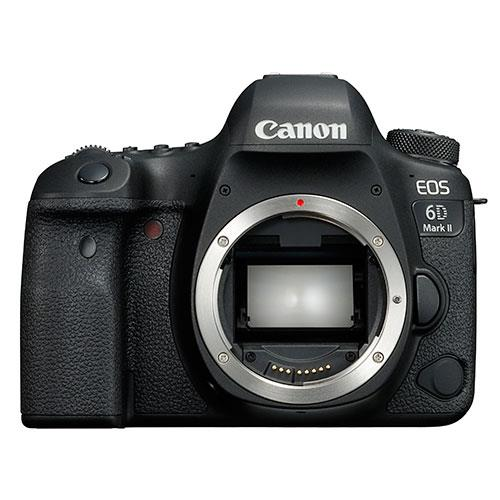 The 6D Mark II is intuitive, user-friendly, and responsive, whether you’re experienced or new to full-frame photography. Get even more creative with DSLR videos and movies, with full HD video, continuous shooting of 6.5fps, in-camera 5-axis digital stabilisation for blur-free shooting, and built-in GPS that geotags images as you shoot. Team it up with a great choice of Canon accessories including the Canon Speedlite 430EX III-RT Flashgun, Manfrotto XPRO Carbon 5 section Fluid Video Monopod for stable video shoots, and a Canon SL100 Sling Bag that protects and holds all your gear.